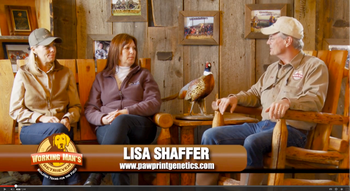 You can now catch some great Paw Print Genetics information on The Working Man’s Retriever television show, which airs during “The Landing Zone” block of programming on the Sportsman Channel. You can also view each episode on the Paw Print Genetics YouTube page at any time! Paw Print Genetics founder and CEO, Dr. Lisa Shaffer, a geneticist with more than two decades of experience, visits with host Dan Hosford and co-host Cynean Kenny in five separate episodes and discusses everything from the basics of how genetics work and the impact upon breeding decisions to when, how and why to test a new puppy and interpreting the results on your Canine Health Certificate. Episode One: In the first episode of Working Man’s Retriever that Dr. Shaffer appears on, she discusses silent, or recessive genes; the differences between clear, carrier and affected dogs; how you can still safely breed dogs that are carriers of known genetic mutations and how, with consistent genetic testing you can eventually eliminate genetic mutations from your breeding program. She also touches on how a Canine Health Certificate adds value to a litter of puppies and acts as a safety measure for the puppy buyer. Episode Two: Is it ever too late to test a dog for a genetic disease? Dr. Shaffer answers that question (spoiler alert: you can test at any age), but stresses the importance of testing working and service dogs, which will receive hours of costly training, early in life if possible. The reason for this is that many diseases – such as some that cause blindness or epilepsy, for example – are late onset, which means they don’t manifest until the dog is usually between the ages of two and four years old. For puppy buyers, it’s important to ask the breeder for a Canine Genetic Health Certificate from both parents so that you know exactly what you’re buying. She also explains why Paw Print Genetics chooses to use a non-invasive cheek swab instead of blood for all their genetic testing. Episode Three: Dan Hosford and Dr. Lisa Shaffer sit down to discuss pre-breeding strategies when it comes to genetic diseases. A Canine Genetic Health Certificates from both parents confirm which genetic diseases each dog is either clear, affected or a carrier of. If both parents are clear for the same genetic mutations, then their puppies should be clear, too. However, if one parent is clear and another is a carrier (or affected), then a percentage of the litter will carry the mutation. Even if someone has produced several litters, their dog could still be a carrier and have just been lucky when it comes to producing unaffected puppies. Episode Four: Dr. Shaffer shows you how to properly obtain a cheek swab from your dog – which part of the cheek to swab, how long to swab different areas and how to obtain the most cheek cells on a swab. She also explains what not to do when swabbing – including contaminating the swab, how long to wait to swab after a dog eats and why cheek cells are preferable to saliva. Episode Five: In this final installment of the health segment on Working Man’s Retriever, Dan Hosford and Cynean Kenny visit the Paw Print Genetics laboratory to receive the results of Kobe, the show’s mascot, screening and interpretation of his Canine Health Certificate. Dr. Shaffer explains the breeding implications for Kobe and what it means for any of his potential puppies. The costs of genetic testing is also covered and how the small upfront investment gives breeders, owners and puppy buyers a lifetime of knowledge and assurance when it comes to canine genetic diseases.